EMT Spray is an essential part of any first aid kit. EMT Spray has a convenient pump sprayer which allows for no touch application on sensitive wounds making application easier for the owner and the animal. Nutritive collagen protein provides fast healing of cuts abrasioins burns injured foot pads hot spots surgical and general wounds. Reduces bleeding pain itching and protects wounds. Minimizes scarring strengthening regenerated issue forms a barrier against infection encourages natural blood clot formation. Available in gel or spray formula. 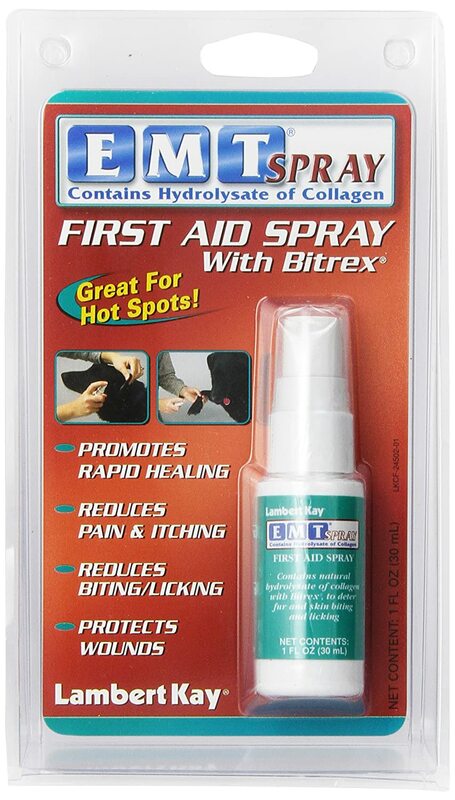 EMT Spray contains Bitrex which is very bitter to deter biting licking of wounds sores so it is perfect for treating hot spots.